Bulb Spacing: 3.3 ft Bulbs Count: 15 bulbs. 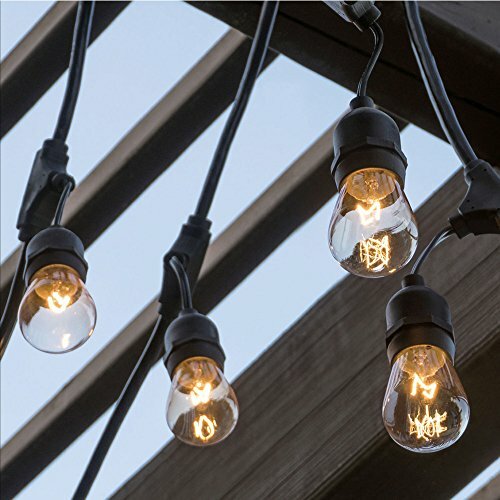 Ambience: the most classic string light, perfect for creating ambience,vintage style，making your lawn and patio a retro café or party place, looking so warm and cozy. Commercial Grade: This string lights is weatherproof, heavy duty and UL tested. Buy with assurance. Up tp 10 year warranty. You will not be disappointed with its quality and performance. Easy install: Just hangthe tring first, and then install the bulbs. No additional assembling needed. Super easy and fast. Even a kid can finish this job well. Up to 7 strings (11watt bulbs)/40 strings (2 watt bulb) connection: each string come with a female plug at the end, so you can connect up to 7 strings to gether to decorage a larger places. No limites to its length. And socket interval adjustable. If you have any questions about this product by BABEE, contact us by completing and submitting the form below. If you are looking for a specif part number, please include it with your message.